Carl W. Rawson, photo Minnesota Historical Society. 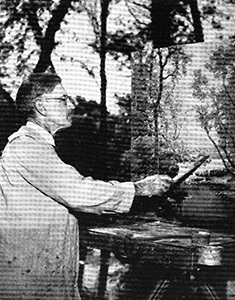 Carl Wendell Rawson was an artist, one of the Minnesota Impressionists, and also a golfer and sportsman. Mr. Rawson was a charter member of The Friends of the Wild Flower Garden and was elected to the Friends Board of Directors in 1954, 18 months after the founding of The Friends. He remained on the Board until 1969, after which he was an honorary director until his death. Carl was born in Van Meter Iowa on Jan. 28, 1884, raised in Des Moines, played on town baseball teams and became a champion amateur golfer. He loved hunting and fishing and it is probably no doubt that his love of the outdoors, frequent camping trips and ventures into the Minnesota woods made him a kindred spirt to Friends founder Clinton Odell. Rawson’s art career began with training in Des Moines, then at the Minneapolis School of Art and the National Academy in New York. He and his wife Louella moved to Minneapolis in 1906 for a position as cartoonist for the Minneapolis Tribune where he worked for nine years. After leaving the Tribune he made a living by painting portraits and then landscapes from the Hudson River to Minnesota. 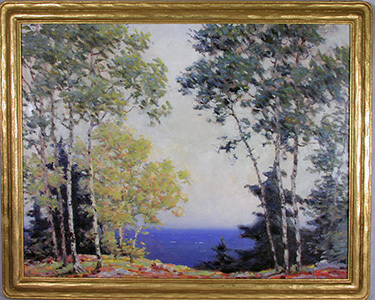 His favorite topic was the North Shore of Lake Superior, where he found scenes for his brush many times - an area that Martha Crone had a special feeling for as well. The Rawsons lived on Kenwood Parkway in Minneapolis. He died on December 4, 1970. Martha Crone noted his passing in The Fringed Gentian™ in January 1971. An example of Rawson's North Shore art, titled “Poplars along the North Store.” This oil on canvas was in the collection of this writer and is now in New York City. Reference: Minutes of The Board of Directors and other documents of the Friends of the Wild Flower Garden, Inc.; Rena Coen, Minnesota Impressionists. Text by Gary Bebeau.